XLDyn software is composed of two modules developed in Microsoft .NET 4.5 Framework. XLSE for authoring OMG SysML compliant system models and XL1D for authoring and simulating detailed 1D multi-physics systems models. 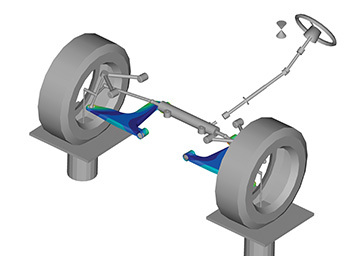 XLDyn is the perfect tool for balancing designs at the system, subsystem and component level. XLDyn can be used in the development of virtually any product. The XLDyn mission is to develop system engineering tools that are fully integrated with an intuitive and easy to use graphical interface. XLDyn provides integrated and easy to use MBSE (Model Based Systems Engineering) software for requirements and verification tracking. It has a wide range of functionality needed by Systems and Simulation Engineers and at the same time provides a “project view” capability that is ideal for managers and teams to keep abreast of project status. ​The XLDyn technology is covered by three approved U.S. Patents, plus one pending. XLDyn is available through the Altair Partner Alliance. XLDyn comes as two additional tabs (XLSE and XL1D) in the Microsoft® Ribbon. The two tabs contain various tools for creating requirements blocks, requirements verifying blocks, and other elements used in Model-Based System Engineering. You can insert links to mathematical models and click them to simulate systems behavior. If you need to verify requirements with tools outside of Microsoft Excel environment, e.g. by running tests, you can electronically send out work requests, and XLDyn can help you track those work orders. 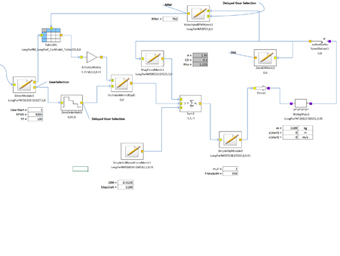 XLDyn will even update the SysML diagrams with the latest results. Requirements can be created from a Word Document or imported from other requirement systems such as IBM DOORS®. XLDyn automatically creates the System Requirements Table (SRT), a snapshot summary of the overall project, from the Word Document. From the SRT requirements hierarchy the creation of SysML diagrams is easy and fast. The requirements diagrams are created semi-automatically with minimal user effort. Verification blocks are easily created and automatically assign MoEs and parameters to cell locations. The internal verification blocks can directly invoke cell equations, user-defined macros, worksheets and 1D multi-physics models (XL1D or solidThinking Activate). These internal verifiers can be executed directly from the SysML diagram and the SRT updates automatically. Fast design studies can be done by changing design parameters in the cells and running the simulation. Additional third party simulation software can be easily integrated with XLSE as additional internal verifiers if desired. External verifiers, i.e. blocks that get simulation and test results from outside XLDyn, can automatically generate a work request email to the assigned engineer and results are automatically updated in the SRT when the results are received. XLSE also provides tools such as FMEA, DOE, and domain mapping. 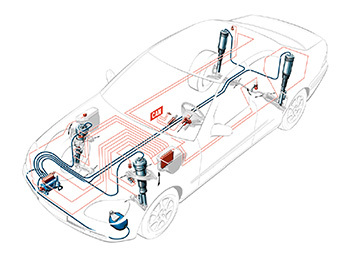 System level DOE can be performed using all subsystems and parameters in the model including test data. Dialog boxes and utility functions simplify the modeling process. Excel objects and diagrams can be moved and copied/pasted. The touch-up tool will adjust the shape, size and alignment of diagrams with one click. XLSE supports templates for configuring systems and subsystems, this means you don't have to start from a blank model each time. Templates can be edited and tailored for specific instances of a product line. 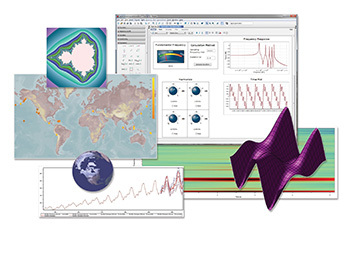 XL1D is a lumped parameter multi-physics simulation tool which uses Excel’s native shapes and images to create icons representing component types, the icons are then connected to form the system model. 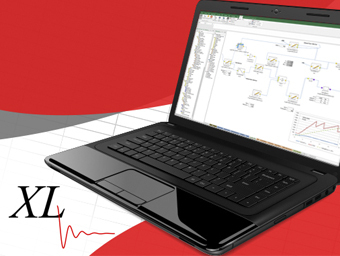 XL1D is completely integrated with XLSE for requirements verification and parametric studies. The component library includes mechanical, electrical, controls/signal processing, thermal, and reliability domains. Custom transfer function block labels reflect the block’s actual governing equation. Automatic connection of components in multiple worksheets into superblocks is available. There is large library of advanced functions for complex model building and management. Component property can be linked to worksheet cells, thus easily enabling DoE, optimization and product variant trade-off studies. Monte Carlo simulation using built in component variation specifications can be performed by simply checking a box. DOE studies can be easily configured with minimal user input. Automated chart and label creation with favorites coupled with the Microsoft Office environment makes report creation a breeze. Built in Units Management allows mixed units for components and one click conversion for output if required. Components can be integrated with product databases. The XLDyn MBSE tools can be applied to all industries, but especially those that have interdependent and complex requirements. It can be used at the System, Subsystem and Component level of product design. Benefited industries include Aerospace, Automotive, Medical, Heavy Equipment, Oil and Gas, and Consumer Products. XLDyn provides the Systems Engineer, Product Development Engineer, Project Engineer, Test or Simulation Engineer the ability to develop and track product requirements. They can develop and graphically document requirement verification methods. 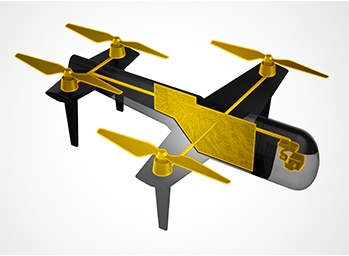 Requirements and design parameters can be balanced to optimize designs. Requirement actuals to targets can be tracked throughout the development process. The System Requirement Table is a summary view of all the requirement targets against the current values which makes an excellent source of information for Project Managers and Executives.